At NHA, we empower people to access a better future, and for nearly 30 years we have been providing nationally accredited certification programs across various allied health professions. We have awarded nearly one million certifications, yet the demand for qualified allied health workers far exceeds the number that can be provided through traditional educational pathways. Through the partnerships of educational providers and employers, apprenticeship programs offer apprentices complete emersion in theory, skills and the professional environment. Moreover, apprentices gain a better perspective on the value of training and how it aligns with their career goals because they are exposed to real experiences and problem solving alongside traditional classroom learning. Apprenticeships have helped healthcare organizations find and retain valuable employees who have been trained on guidelines developed by the U.S. Department of Labor. By earning industry recognized, national certification, apprentices demonstrate knowledge associated with critical competencies, a measure which further promotes quality of patient care and ensures their future mobility to new employees across the country. 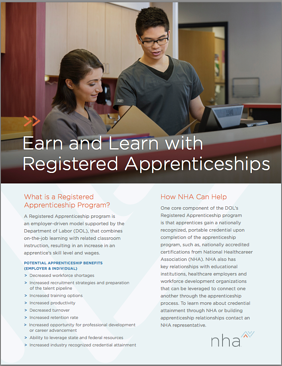 NHA promotes the value of apprenticeships and helps connect industry stakeholders through various communication channels such as social media, email outreach, case studies and educational resources. We will continue to engage with content experts through our governing and national advisory boards in order to ensure content relevancy and industry alignment for our certification exams with the goal of being the preferred certification provider for Allied Health Registered Apprenticeship programs. To learn more about credential attainment through NHA or building apprenticeship relationships, contact an NHA Certification Specialist, or visit these useful links.